Hmmm… yeah, me and this blog haven’t really spoken in awhile. That’s a mistake. Quick update: Things are going well. Remember the whole Secret’s to Success blog? yeah, you do. Anyway, I hadn’t connected with my business partner and truly set that up. We talked all about it, but didn’t set an actual date. From there, it was easy to let it slip and slowly fade to the background as a memory. Meanwhile, my “disciplines” have become quite the rarety as far as getting up, exercising, and accomplishing the things I need to do each day. SO, last week, I met again with this man, and we set a date for real and it was yesterday. Two, count ’em, two days now I have risen early in the morning, got my work out on and then been showered and shaved with enough time for a little quiet time in the morning before work. Awesome. Also awesome? This video, do you remember it? ’cause that’s what I am. apparently. This week I am struggling a bit with some insomnia. I’ve just been laying in bed for 2 hrs. without success and decided to get up and go ahead and write this blog. Often times, this blog will probably contain a review or critique on some sort of media that I have taken in. A friend recently commented to me that it seemed from my twitter and facebook that all I ever do was go to meetings and watch movies. I thought about this and decided that was largely true. I enjoy entertainment and I enjoy the process and patterns behind really good entertainment. So, write about what you know, right? Last night I finished a profound book. 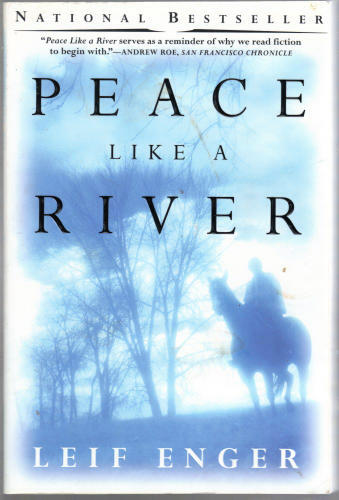 It’s entitled Peace Like A River by Leif Enger. This book effected me deeply. I’m actually having trouble putting into words just exactly how it has made me feel. First off, there’s the way Mr. Enger writes. It’s nothing short of fantastic. His prose flow together like poetry – liquid words on the page; I picked up this book nightly to read, half because the reading itself was so enjoyable. The story is pure and simple. You are immediately drawn to each of the characters. Somehow, and this is the magic that writers have, you feel deeply for each character in this book. I say feel deeply, because though you love each of the main characters, there are others you do not love, but you still feel as deeply about them – truly magic. I don’t want to go off and sound like some sort of romantic, blushing school girl (though perhaps I’ve passed that point already) but I can’t recommend this story highly enough. Here’s a taste, I think the author won’t mind as it will probably get you to go buy the thing yourself: The year is 1962. The narrator is Reuben Land, the son of Jeremiah. Here’s the story of his birth when he almost died—or maybe did die. I was lying uncovered on a metal table across the room. Dad lifted me gently. I was very clean from all that rubbing, and I was gray and beginning to cool. A little clay boy is what I was. I lay in his arms. “Breathe!” The picture I see is of Dad, brown hair short and wild, giving this order as if he expected nothing but obedience. Dad leaned down, laid me back on the table, took off his jacket and wrapped me in it—a black canvas jacket with a quilted lining, I have it still. He left my face uncovered. Christians don’t usually deck their doctors. That’s part of why the book works. There’s faith in it, but not like your usual faith. More strange, like the Bible. That bring me to the two points that most attract me to this book: The first is the “realness” or absolute honesty and integrity of the characters. I mean integrity in the sense that the characters are who they are, through and through. It’s also really real. This is no dream, fantasy or some escape into a world that’s too good to be true. There is great pain in this book. but also great faith. not the fake stuff you see in (forgive me) Left Behind or Fireproof (again, sorry, this is not the place to rag on those stories). The last thing that I want to say is that this book truly ends well. Many movies, books, and ideas start off really well, but true greatness comes from ending well. Life is a journey, but there is also a destination and it is of great value. If you don’t end well, the journey may be for nothing. I am glad to say that this book ends well. A true feat, but any standard. I haven’t found a book that has moved me this much in a long time. I wept at the end and immediately wished I’d never read the book just so I could have the experience of reading it for the first time again. This book is powerful and wonderful and will remind you of why we read in the first place. Get it. You won’t regret it. You are currently browsing the James' Personal Blog blog archives for February, 2009.